Following my review of the BlackBerry Curve Case at the end of last year, today I am going to review another product: a KitSound iPod Dock called the XDoc. As always, I will strive to remain impartial. 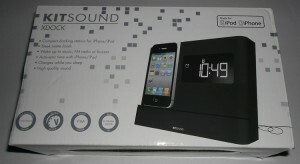 KitSound’s XDock is an iPod dock, radio, alarm clock and time display unit. All iPod docks are different, some focus on portability, others on sound quality, and others on multi-functionality – the KitSound dock is the later. How portable is the XDock? Well it isn’t. 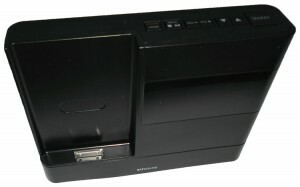 If you put two AAA batteries in the base of the unit, were there a power cut, or were you to want to move the dock between rooms, then the batteries will keep your settings (i.e. the time and any alarms you have set) but they won’t keep it on. Without a mains power supply, you can’t play music or use the clock. The clock has a very clever feature. When you dock your iPod, after a few seconds the XDock synchronises the time it displays you with the time on your iPod. Handy if it starts to lose time, or you don’t want to try and set the clock manually, however if you have just come back of a holiday from Italy (moi), and you have forgotten to reset your iPod to the current time, it could be a little annoying if you have just spent 10 minutes trying to set the time! If you set your iPod to the right time (which is much easier than programming the XDock) then the time synchronising feature is very useful. 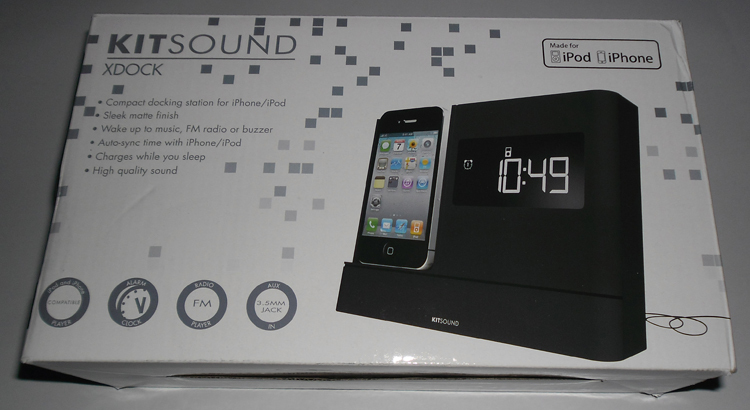 Unlike most iPod docks, the XDock also has an inbuilt alarm; in fact, it has two! You can choose to be woken up (assuming that’s that you would use the alarm for) to your favourite song, a buzzer, or the radio. I am not going to lie, at first programming the XDock was a little tricky, but all the instructions you need are in the handy User Manual. 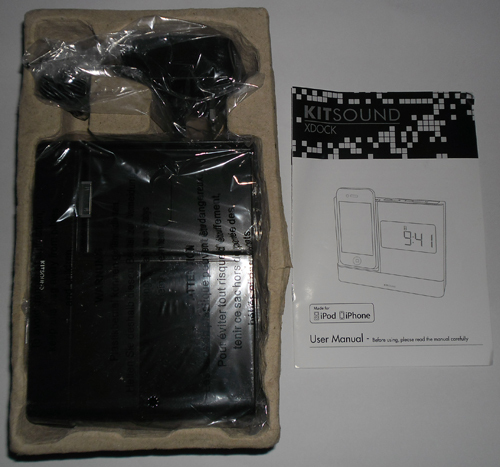 The XDock User Manual is unlike most instruction manuals, in that it is short (short and sweet encourages more people to read it) and written in a casual, slightly humours way. An example of this can be seen in the section entitled ‘Common Sense…‘ where this list can be found (I have excluded some of the entries). Give the X-Dock a drink of anything: it is not thirsty, it is full of clever electronics which are no good at swimming, they will all drown and die with puffs of smoke if you get them wet. So no dancing naked with it in the rain either please. Drop the X-Dock: it won’t like you for it and your warranty will be invalid. Hit it with a hammer / similar blunt object / run over it with your car / take it base jumping (or any other experience that would be considered traumatic for a little box that just wants to play your tunes and wake you up this list is not exhaustive). If you get an XDock, my advice would be to read the instructions, as it is hard to use without reading them, and they are worth the read, as I am sure you can see! To the best of my knowledge, the XDock is compatible with all iPod’s and iPhones with the standard, Apple iConnector. Any Apple devices with the new Lightning Connector are not compatible. Because of the nature of the slot where your music player/phone slots into the XDock, iPads won’t fit, so if you are looking for an iPad dock, this isn’t the device for you. You can connect other audio devices to the XDock using the AUX-IN jack at the back of the dock. It is a standard 3.5mm audio jack socket, so the dock is potentially compatible with more devices than just iPods and iPhones. I like the XDock, and it has been waking me up for a few days now. It is handy to know that if there is a power cut in the night, as long as it returns by the morning, my AAA batteries will ensure that I am still woken up on time. It would be good if the XDock had a slightly better speaker system, maybe two speakers for stereo sound would be better, but the quality of the mono speaker can’t really be argued with. I would also like it more were it to be portable, but that would probably involve a lot more batteries, so in some ways it is a good thing. Mobile Fun are the company who sent me the XDock, and they have asked if we would mention that they sell iPhone accessories, so you know where I got the iPod dock from! Maybe the lack of portabillity was intended to stop the dancing naked in the rain. For me the sound quality is key with an ipod dock followed by how many different formats it can play (ie, usb, cd, radio ipod etc). A digital radio is also a handy one to have. Only just seen this comment Neil – not sure how I missed it! Maybe you are right. I can’t say I have ever been dancing naked in the rain to music. Clearly something to do in the future! How do you cancel an alarm on this kitsound? You can set two alarms, one controlled by the volume up key – press that when the clock is in sleep mode (achieved by holding the mode button until the screen dims) and the other controlled by the volume down key. There are four settings, alarm by radio, alarm by iPod, alarm by buzzer and no alarm. Keep clicking the volume up or down until you can’t see radio/iPod/buzzer and then stop – that cancels that alarm.